This story was written by Mike Allen and John F. Harris. 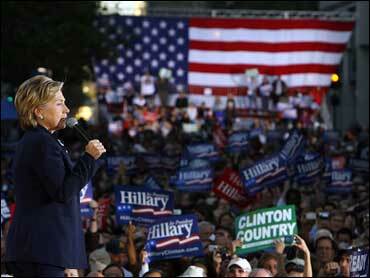 Sen. Hillary Rodham Clinton (D-N.Y.) last week flew into a sudden burst of media wind shear. After months of mostly rosy portrayals of her campaign's political skill, discipline and inevitability, the storyline shifted abruptly to evasive answers, shady connections and a laugh that sounded like it was programmed by computer. Clinton's campaign attributed the change of weather to the vagrant attention span of the national news media, combined with the professional interest of reporters and analysts in ensuring a competitive race for the Democratic nomination. Hillary Clinton, like her husband, can take solace in the fact she has survived and prospered amid peevish coverage from New York and Washington news organizations - stories that often echo the buzz in social circles in both cities. This week's stories, however, all in various ways highlighted what her strategists and independent analysts have recognized as a genuine challenge for her in 2008: overcoming perceptions that she is a politician so infused with ambition and artifice that she can not connect with ordinary voters. The New York Times ran a Sunday story about what it called "the Cackle" - it is actually closer to a guffaw - suggesting that it is the senator's technique for disarming persistent questioners. In the same issue of the Times, columnist Frank Rich pondered whether she is too cautious and contrived in a piece headlined, "Is Hillary Clinton the New Old Al Gore?" On the facing page, columnist Maureen Dowd argued that, "Without nepotism, Hillary would be running for the president of Vassar." The day before, columnist Gail Collins had called one of Clinton's answers from Wednesday's debate "an excellent example of how to string together the maximum number of weasel words in one sentence." The Associated Press ran an unusually harsh post-debate analysis called "Clinton's evasions," with the headline: "Evasiveness on issues contradicts image Clinton seeks to project as strong leader." And Washington Post columnist David S. Broder complained about her "dodginess" in the debate, and many outlets mocked her answer to who she would root for in a Cubs-Yankees World Series: "Would probably have to alternate sides." Even Jon Stewart bared fangs on "The Daily Show," splicing together clips from Sunday morning shows that his network, Comedy Central, calls "creepy delayed laughter" on a segment called "Hillary's Laugh Track." He suggested the candidate was bionic. Such mockery represents a distinct turn in her coverage of this year. Until lately, most of it has focused on a supposedly "New Hillary:" Someone who is rapidly closing the gap between her husband's and her own political skills, which she has put to use coolly swatting aside potential rivals for the nomination. A convergence of factors is now putting emphasis on the supposedly "Old Hillary": Someone who is ruthless in self-advancement, who may get tripped in the end by her and her husband's overreaching. The less flattering storyline was fed by recent revelations about the prominent role that fugitive-from-justice Norman Hsu was playing in her fundraising operations, and a Wall Street Journal story last week raising questions about Bill Clinton's post-presidential business dealings with a young Italian jet-setter. The caustic critiques were especially striking because they followed eight days of priceless, overwhelmingly positive press surrounding the rollout of Hillary Clinton's "American ealth Choices Plan." Clinton granted at least 19 lengthy interviews to networks, columnists and reporters, producing headlines like "Why it's better this time" on the cover of Time magazine. A Newsweek poll released Saturday found that while Clinton led among all Iowa Democratic voters, "Obama enjoys a slim lead" among likely Democratic caucus-goers. The senator's staff sounds unsurprised by the sharp turn in the coverage. "These things come in cycles, and the press is invested in making this a race," a Clinton aide said, speaking on condition of anonymity in order to speak more bluntly. "We take the long view, which is that nobody's voting tomorrow. This is a long race, and the campaign has been built for the long haul. I'd rather be 20 points up than 20 points down." The Clinton aide added: "The issues that she is getting the good press on, like health care, are so much more important than the issues that we have gotten the more recent press on. We do not believe that this is a race that's going to be decided on which candidate has the more melodious laugh." Once in the White House, both were disdainful of what they saw as the tendency of Washington and New York journalists to cover personality, political process and scandal over substance. Even late in his presidency, establishment journalists like Howell Raines at The New York Times and Sally Quinn of The Washington Post could provoke profane outbursts from Bill Clinton - attitudes that aides say Hillary Clinton usually shares. Other campaigns note that Hillary Clinton's problems go beyond New York and Washington mandarins. In the Rocky Mountain West, there are questions about her electability and polarization, raised in a Sunday piece in the Los Angeles Times. The article cited "huge negatives" for Clinton in this region: "The New York senator and Democratic front-runner was by a wide margin the most unpopular of 13 potential presidential candidates in Montana. … Recent polls in Colorado, Nevada and Arizona have found similar distaste for Clinton." The senator's supporters can take comfort in the fact that the new skepticism is a backhanded but distinct compliment: The press corps thinks it knows where the train is heading and doesn't want it to happen too fast. On Slate.com last week, political writer John Dickerson published a piece called "How to Stop Hillary: Six strategies for her Democratic rivals."